The government released the much awaited pricing formula system of auto fuels at the Finance Ministry yesterday. Finance and Mass Media Minister Mangala Samaraweera said that the formula pricing system of Auto Fuels was MRP = V1 + V2 + V3+ V4 and added that internationally there is a decrease in the fuel price and if it continues there will be a decrease in the price next month. He said that at present the price of fuel per barrel has been decreased by USD 5. “This is the simplest formula that all were asking for and here it is”, said the Minister showing the price formula written on a board. The Cabinet of Ministers granted approval for implementation of a cost reflective formula based pricing system of Auto Fuels effective from May 11, 2018. 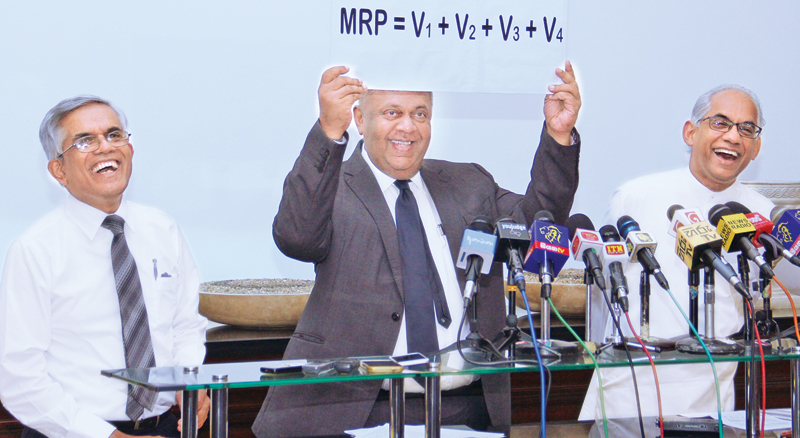 Minister Samaraweera said that they form the pricing according to the formula every month based on four values. The pricing formula was constructed by a Technical based following components of the supply of auto fuels, Landed Cost, Processing Cost, Administrative Cost and Taxation. Accordingly, the Maximum Retail Price (MRP) of the auto fuels was established as follows: MRP = V1 + V2 + V3+ V4 where MRP is Maximum Retail Price of Auto Fuel. Minister Samaraweera said that V1 is the Landed Cost (Rs/ Litre), which included Singapore Platts Price per Barrel, weighted Average Premium per Barrel, Loss due to the Evaporation and Exchange Rate (US$/ LKR) are applied, V2 is the Processing cost which includes local port charges, Transport Cost, Dealer’s Margin including losses due to Evaporation to dealers and stock holding cost, V3 is the Administrative expenses including Personnel Cost, Depreciation and other cost elements, if any and V4 is the Taxation which includes Customs Import Duty, Excise Duty, Ports and Airports Development Levy and National Building Tax. He said that even in Saudi Arabia where fuel is produced, there is a tax and one way of providing several benefits are based on the taxes levied. He said that the tax levied in Sri Lanka is comparatively low compared to the other countries in the region. “Tax levied on Petrol in India was SL Rs.82.14 and Diesel SL Rs. 47.52 but in Sri Lanka it was Rs. 53.68 for Petrol and Rs. 25.48 for Diesel. In England Rs.178.70 for Petrol and Rs.180.27 for Diesel,” the Minister said. He further said that none of the previous governments changed the pricing formula when there was a decrease in the international pricing of fuels and added that the government was sensitive towards the issues faced by the public. State Minister of Finance Eran Wickramaratne said that the Ministry decided to release the formula as they do not have anything to hide from public. “Before the system was only one sided. Now when the international fuel goes up and down, the price formula differs and that is the better side of it”, he said. He further said taking the Maximum Retail Price into consideration, in India they charge 33 percent tax for Diesel, 58 percent in Pakistan, 19 percent in Sri Lanka, 12 percent in Singapore and 60 percent in Britain.